We spent over 42 hours researching and testing more than 18 different types of cake decorating stands and found that functionality, sturdiness, and cost were the most important factors consumers looked for when shopping for cake stands. Wilton Tilt-N-Turn Ultra Cake Turntable and Stand scored high marks in all categories and is our overall top pick. This rotating cake decorating stand is the perfect place to set your cake so you can decorate it and then display it without having to move it. 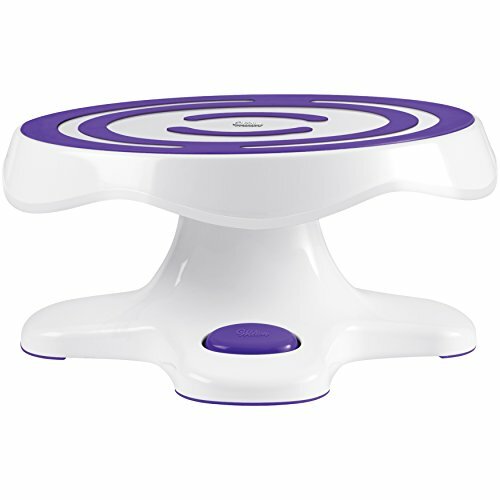 The unique design of this cake decorating stand allows it to be tilted and even locked into place for maximum stability while you are decorating. It is the perfect display stand for any cake you make. If you do a lot of work with cakes you are familiar with the benefits that a cake stand can provide. Not only do they make it easy to decorate the cake properly they display the finished product beautifully as well. There are many different styles and brands of cake decorating stands on the market to choose from. With so many choices it can be overwhelming to figure out which ones are the best ones and which ones are flimsy and cheaply made. We have taken the three top-rated cake decorating stands on the market and reviewed them below so you can read about their features and learn more about them. In addition to the reviews we have included a buying guide so you can learn more about the different cake decorating stands and sort through all the choices on your own. This knowledge will make the buying process much easier and virtually stress-free. Wilton is THE name in the cake decorating and supply industry; known for their high quality products. This tilt-in-turn cake decorating stand offers features that others don’t most notably the tilting feature. This unique feature enables you to decorate the cake properly from all sides without having to struggle with awkward angles. It is also beneficial for lettering and decorating cookies as well. The plate on top rotates easily in both directions and has a locking feature so you can do detail work without the plate moving. The base is 5” tall which is very helpful in taking strain off your back and shoulders while you are decorating. The non-slip feet and weight-balanced base keep the decorating stand secure so it won’t tip of slide. This cake decorating stand can hold cake boards that are larger than 12” in diameter and is perfect for decorating 3D cakes, square cakes and round cakes also. Ateco is another well-known name in the cake decorating industry. 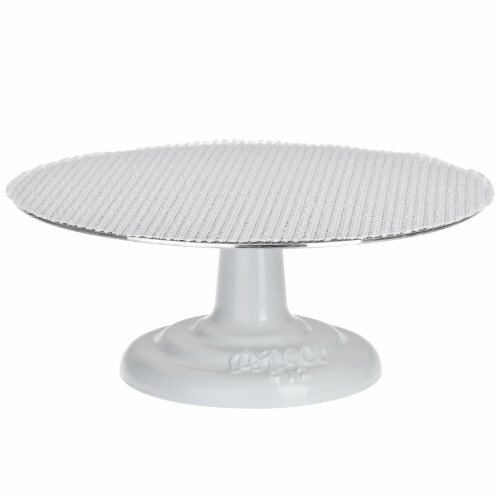 This revolving cake stand is perfect for decorating all types of cakes. The base is made of durable cast iron with a powder coating that is scratch resistant. The top measure 12” in diameter and is made from aluminum that is .125-inch thick. The stand is 5” high and included a non-slip pad which makes it easier on your back and prevents the stand from sliding while you are working. This USA made cake decorating stand is also the perfect way to display the finished product. You should not immerse this stand in water to clean it. This solid, long lasting cake decorating stand will last decades with proper care and makes a great gift for a cake decorator. You’ll be able to decorate all kinds of cakes with the Ohuhu cake decorating stand. It is made with steel bearings for the ultimate smooth rotation and can hold 11” diameter cakes easily. The stand is made from aluminum alloy that is FDA approved to be safe for food use. The non-slip surface on top of the stand keeps the cake secure while you are decorating it. The base is 7.3” in diameter for stability as well. This functional and efficient cake decorating stand is very easy to clean. Ohuhu offers customers a 30 day money back guarantee along with lifetime support. There is also a 12-month replacement warranty as well ensuring customers that the company stands behind their products 100%. Along with this great cake decorating stand there is an icing spatula and three smoothers with different edging. The three top-rated cake decorating stands featured above offer everything a cake decorator is looking for whether they are just starting out or have been decorating cakes for years. They are sturdy in design and feature turntables that rotate smoothly, can be locked into place and offer some additional features as well such as the turn-n-tilt model by Wilton. Taking the time to ensure that you have the right decorating tools on hand when you are working with your cakes is very important to the quality of the finished product. When the decorating supplies you use are top quality you will have a much easier time with the steps you take during the decorating process. If you are ready to purchase a cake decorating stand, choosing one of the top-rated models above is a great place to start. If you don’t see what you are looking for in any of these selections we have added 7 more cake decorating stands for you to consider. There are many different styles and brands that you can choose from when you start shopping for a cake decorating stand. Before you purchase one it will help you to understand some things about them so you know what to look for once you start shopping around. We have listed these considerations below. Cake Weight – The amount of weight a stand can hold will depend on the quality of the stand as well as the manufacturer that made it. When you are in the cake decorating business it is important to ensure quality supplies so your cake doesn’t get ruined by a cake stand falling over or breaking during the decorating process. If you want to know about how much weight the stand can handle, look on the description and check with the manufacturer. You can also stack books or weights on the stand that weigh the same amount as the cake you will be putting on it to see how sturdy the stand remains. If you are working with a tiered cake, such as a wedding cake, it is very important to note that cake decorating stands are not a good match for displaying a tiered cake. You can use it to decorate the smaller rounds but your display stand needs to be strong and stable so the cake doesn’t fall over. Below we have listed the common cake stand sizes along with the amount of weight they can typically hold safely but make sure to do your own checking to be on the safe side. Cake Stand Sizes – Choose a cake decorating stand that is the same size as the bottom tier of the cake you are decorating. Most tiered designs will be created using a cake board so try to ensure that your cake stand and cake board are the same. If you’re decorating a simple cake with not a lot of decoration on it, look for a stand that is the same size as the cake for a seamless, appealing look that displays beautifully on the table. If you have a lot of embellishments that you are adding to the cake, you can choose a cake stand that is a little larger than that bottom tier so there is room for the embellishments to rest without falling off the cake stand. Do not use a cake decorating stand that is smaller than the bottom tier of your cake. Using a smaller stand results in instability and could end up toppling the cake. Construction – Make sure that the cake decorating stand you choose is sturdy and rotates smoothly. This is very important since rough or choppy turning can cause you to mess up decorations that you are applying to the cake. Additionally, a cheaply made stand can break altogether, tipping the cake over or ruining it which is something you don’t want to have to explain in your cake business. It is always better to purchase the best quality cake decorating stand you can get for your budget and be able to be confident in its ability to securely hold the cake while you are decorating it. Cake decorating stands are typically made from plastic, aluminum, and even glass. Some are designed simply for decorating and others double as a display stand as well. Make sure that the top plate of the stand is flat without any dips. This is very important so it will support the cake and not cause the cake to sag. The manufacturer of the cake decorating stand you choose is very important. Purchasing your stands from reputable companies is always a plus because you will be familiar with their products and the company name from the beginning. These companies are well-known for good reason so you can be reasonably sure that whatever cake decorating stand you choose will be a good one that you can trust. One of the best ways to get insider information, especially if you are just starting out and don’t know the popular brands very well, is to check out what other customers are saying that have purchased the cake decorating stands you are interested in and have used them personally. This kind of hands-on information you can’t get from the sales websites. Customers are usually happy to share their experiences with a product they have purchased, good and bad, so you will be able to read about the features they liked and also learn about what they didn’t like. This is very important information to have when you are comparing different decorating stands. Something you should be looking for when you shopping for cake decorating stands are guarantees and warranties that will protect you in the event of a faulty product or one that breaks when you use it. Companies like Wilton and Ateco routinely offer guarantees on their products so you can rest easier knowing you have purchased a stand that the company stands behind. Make sure you read the warranty fully so you understand what it covers and what it doesn’t cover. It is also important to note guarantee periods and rules regarding refunds if you want one. There are several different features that a cake decorating turntable can offer. Below we have listed the different features that are available so you can see which ones are important to you. Ball bearings – This is an important feature because the ball bearings make the turntable rotate easier and with less noise than those without it. Depending on the model, some will allow access where 3-in-1 oil can be added every once in a while if necessary. Most ball bearing turntables last years without any problem provided they are cared for properly. Locking – Wilton was the first company to come out with a locking turntable. This allows cake decorators to keep the cake still when you are adding layers or working on intricate embellishments. Locking cake decorating stands will cost a bit more but it is a feature that is well worth it. Tilting – One of the top rated cake decorating turntables featured above offers this great feature. Many cake decorators do intricate designs on the sides of the cake which can be difficult if you are working sideways. Most can be locked into any number of positions including flat and many different tilting levels that will make these intricate designs much easier to apply. Dual Side – A lot of commercial bakeries use dual side turntables. One side is round and the other is rectangular. All you have to do is flip the stand to the size that works with the cake you are decorating and you’re all set. The rectangular side is perfect for sheet cakes and square cakes. These dual side stands are usually pretty sturdy and can be used for tier cakes as well. There is a difference between a cake stand used for decorating and a cake stand used for display. Some of the cake decorating stands can also be used as display stands so if that is something you want, be sure to look for models that can handle both. 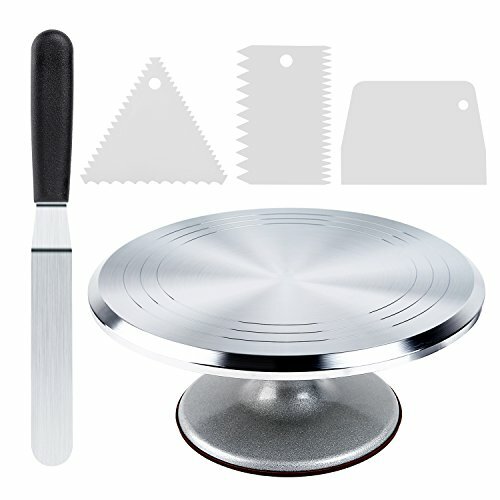 A cake decorating stand will usually be made of plastic with steel bearings in the turntable for smooth rotation during the decorating process. This turntable can usually be locked for any detail work that you need to do. Depending on the decorating stand, you may find some with great features such as locking turntables, tilting, and non-slip surfaces that are designed to make decorating much easier. A cake stand is used for displaying the cake where you will be serving it such as a wedding, party, or anniversary cake. Cake display stands can be made from a number of materials including glass, aluminum, steel, and plastic. Many come with domes for added cake freshness and to present a neat and clean atmosphere for your cake. Cake display stands come in a variety of finishes and colors so you have some choices that can match your venue and event. The color and finish you choose will depend on the event the cake is for and can make the cake appear more formal or casual depending on the colors you choose. If you spend any time at all decorating cakes you would benefit from a cake decorating stand. With so many choices to select from you can find cake decorating stands to fit almost any size and shape cake you are working on. These stands will make decorating a lot easier and more efficient especially if you have detail work to do. The three top-rated cake decorating stands we have featured above are all high-quality stands from reputable companies that are known for their cake decorating supplies. All three have great features that make them great for decorating cakes, cookies, and for doing lettering as well as other embellishments. All three stands have locking features so you can ensure no movement while you are working. If none of the featured cake decorating stands appeals to you, the buying guide we have provided will help you understand a little more about what makes a good quality cake decorating stand, the difference between a decorating stand and a display stand and how to choose the right one for your needs. This knowledge will enable you to sort through all the different stands on the market and choose one according to your specific decorating needs.